Unlike any recent American film, Jeff Nichols’ Cannes Critics Week winner Take Shelter gives expression to an extremely nervous country. The pleasure of good action, suspense, or horror films is that they elicit a physical response, drawing out a reaction and release in the viewer that can even be transformative. The viewer is being manipulated into a response, but it’s a willing bargain between the audience and the filmmaker, and the physical aftermath is palpable proof of a stark cinematic power. This is also why such manipulation can be dangerous, and why there’s an entire school of cinema thought against such manipulation. But while Take Shelter doesn’t shrink from taking up an audience and playing with it, it’s made with an exceptional eye and ear sympathetic to the anxieties that it dramatizes. The matter at hand is, as in Nichols’ highly astute debut Shotgun Stories (2007), American men grounded in stoicism yet suffering internal meltdowns. 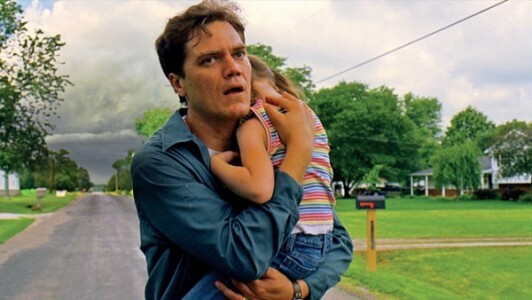 While the emotions trail the technology in the Hollywood version of action/suspense/horror, Nichols’ version positions a working man, a husband and father named Curtis LaForche (Michael Shannon), in the foreground of a classic Midwest landscape, and then watches as his mind comes crashing down around him in the form of his visions of spectacular, Turneresque storms that appear to be building toward some kind of apocalyptic crescendo. Form (effects) follows function (unarticulated male fear). In conversation, Nichols never mentions The Birds (1963) as a reference point, but it’s hard not to consider Hitchcock’s last masterpiece as a direct relative of this new film’s unnerving ability to construct a correlative for all sorts of angst gnawing away at the American character. In Sundance, the sometimes utterly crazy audiences and responses served to confirm the worst, grinding fears that are manifested on Shannon’s ever-changing, Lon Chaney-like face; just as he was peppered with questions from Berlin Forum audiences about Shotgun Stories being a fable about Bush-era warfare, Nichols was hit with Sundance questions regarding this or that conspiracy, and if he subscribed to them as much as the questioner clearly did. Hitchcock received the same kind of paranoid responses from a Cold War-era audience already rattled by the Cuban missile crisis and the nuclear spectre, and in Take Shelter and its depiction of an environment gone so haywire that oil appears to fall from the sky (and that’s just the first scene), history and cinema appear to repeat themselves. 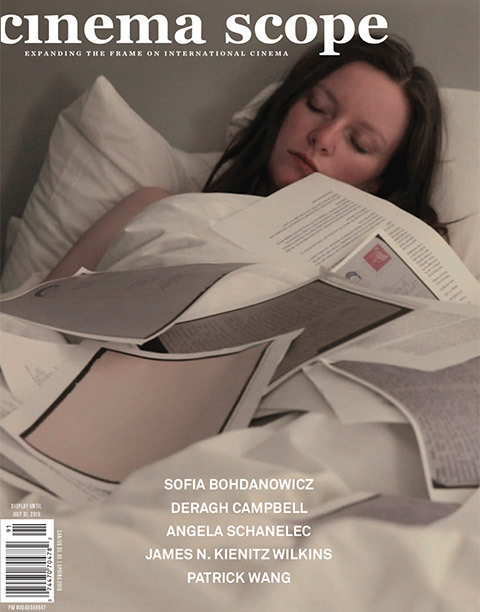 Yet Nichols is finally not a Hitchcockian director, but, as he correctly identifies himself, a writer who also makes films that delve into states of mind, an explorer of psychologies (particularly male psychologies, though here, in an expansion from Shotgun, he fully dramatizes a marriage in deep crisis), and a self-identified Southern writer. His heroes are the likes of Flannery O’Connor and Larry Brown, who he notes likes to “sandbag his characters from page one.” That’s what happens in Take Shelter, exerting a pressure that’s difficult to exactly measure, yet unmistakable in its effect. CINEMA SCOPE: Since there’s such a lag time between the making of a film and when it’s first seen, are you surprised at how the anxiety that runs through your film taps in so much to our present moment? Even the crazy weather patterns? JEFF NICHOLS: I think I was a bit ahead of the curve, since I wrote it in 2008, which was also an anxious time, for sure, but, yeah, now it feels even more so. This film deals with two kinds of anxiety. There’s this free-floating anxiety that we generally experience: you wake in bed and maybe worry about what’s happening to the planet, to the state of the economy, to things you have no control over. In 2008, I was particularly struck with this during the beginning of the financial meltdown. Then there’s a personal anxiety. You need to keep your life on track—your health, your finances, your family. I was in the first year of my marriage, and I was thinking a lot about what it meant to be married and committed to someone, why some marriages work and why some don’t. But I also realized that anxiety isn’t enough to make a complete story. Anxiety is an effect, not a cause. I was pondering that since a certain amount of anxiety comes out of one’s marriage, then perhaps anxiety is born out of things that can be lost. When I was making Shotgun Stories, I was single, nobody knew who I was, I had nothing to live up to, I didn’t have as much to worry about. But as I was building up my life, I had a sense that I could lose what I had. That creates anxiety. And so writing was a way of dealing with these feelings, and how to make the marriage work. SCOPE: In the film, both of these anxieties as you refer to them—the free-floating kind, the personal kind—seem to be simultaneously metaphorical and organic. NICHOLS: The key reason for this may be because I’m struck by images that somehow stick and don’t go away. In Shotgun Stories, I had an image of a man with shotgun pellets in his back. I don’t know where that came from. For Take Shelter, I had an image of a man standing over an open storm shelter. As I was working through those issues about anxiety, I was also working out this image. I grew up in Arkansas, and if the sky was clear on Wednesday, they would test the storm sirens. We grew up with a sense that things could get dangerous quickly with storms blowing through. If you think about the storms fully, they’re a form of nature. I don’t think of character as protagonists and antagonists. Nature is the best kind of villain since it has no malice, it simply is. That to me is far more terrifying, and ties in to that free-floating anxiety of things you have no control over. Storms seemed to me like a perfect way of visually expressing fears. Besides, I’m a sucker for clouds and it seemed like an interesting way to go visually. SCOPE: In Sundance, when people weren’t asking you crazy questions that seemed more about their own paranoias than the film, they were pressing you for interpretations of what happens in the film. Do you think, though, that it’s necessary to provide explanations? NICHOLS: Everybody seems to want you to announce that you knew exactly what you were doing. But I think I’ve found it interesting—having made the film—to pick it apart, and then realize that, yes, I was thinking about these things, and even more. And then you process these ideas and you apply them to specific scenes and details, and they’re all tied to anxiety. You then realize that’s the unifying feature of the film. SCOPE: How do you go through that process of understanding the material? NICHOLS: I get to the point where I fully understand the everyday pressures that are impacting the characters: the economic challenges, the family pressures. Flannery O’Connor remarked, and I’m paraphrasing, that writing is at its best when it goes beyond the writer’s own scope and point of view. It’s very tricky, because by definition, you’re the creator, so how do you make it greater than your own purpose? There are some things that I do to get to that point. 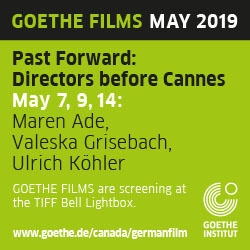 I knew that once we were on the festival circuit, people would be asking plenty of questions about the film, since when we showed Shotgun Stories in Berlin, audiences were asking me about how the film was full of metaphors about Bush’s foreign policy. Now, that was a case of people bringing their own meanings. So I was thinking that if I can think of big topics and ideas, I can write about those ideas, and explore them, but obliquely. I never talk about environmental crises in Take Shelter. You see this oily substance falling out of the sky, but it’s never explained. Curtis never talks about his own sense of the environment. I’m into the idea of how these films can operate on several different levels and can be interpreted by many different audiences. Finding the balance between telling my own stories and leaving room for many various readings and interpretations, to leaving them open to a certain degree, is a really interesting process. SCOPE: This is the notion that Kiarostami talks about—making a film that allows the audience to complete it. NICHOLS: Yes, and though I could make abstract films, I don’t want to. I’m fighting for a balance between the various notions. I’m writing a new screenplay, and it’s always the question of how much is explained and how much isn’t. I enjoy some studio films, but I want to go further with narrative and structure. The risk is that most audiences won’t like the film. I’m not making films just for myself. I’m always concerned with the audience. I don’t refer to myself as an artist, I always think in terms of being a storyteller. SCOPE: How do you convey these things to your actors? Do they demand further explanations and background? NICHOLS: There are no formal rules about how to treat actors, since every actor is different. This was glaringly apparent when making Shotgun Stories, because I was working with a mixed cast of non-professionals, a few actors developing their craft, and Michael Shannon. I knew I couldn’t talk to some of the actors the way I could with Michael. On Take Shelter, I had an extraordinary cast, but the differences between them were just as strong. I don’t know if Mike works this way with everyone, but we don’t talk much, and we don’t really rehearse. It’s a very simple back and forth, he’ll say, “This guy reminds me of this, he’s this kind of guy,” we have very simple conversations like that. He shows up and delivers. I wish everyone could see what Mike can do. So far, filmmakers have only scratched the surface with him. He can do whatever he wants. Directing him is like having the keys to a great race car. Shea Whigham, on the other hand, loves to talk and I do too, so we’d sit in a coffee shop and go on and on about his character, Dewart. We discussed Iago, and envy, but Shea had a different perspective and didn’t think Dewart was envious. That kind of conversation doesn’t happen with Mike. He was also that way on Shotgun Stories. I would film him, call cut, and try to think of things to say to him but I didn’t have much to say, since he brought it all during the scene. He makes my dialogue sound really great. Jessica Chastain (who plays Curtis’ wife, Samantha) was somewhere between Mike and Shea. She was big on knowing where her character had just been before the scene we were working on. For the scene when she slaps Curtis, I had done a time jump, and her process helped catch me; I realized that I needed to fill in a missing piece for her character, which turned out to be a real benefit. Some actors need to know a lot of backstory, some just need a sense of the previous scene, and some, nothing at all. SCOPE: Perhaps because of the particular cast of actors in Take Shelter, there’s a greater sense of actors interpreting characters. Did you observe this? NICHOLS: I hadn’t thought of that, but it’s interesting that you observed it. It may be there. I wonder if part of this sensation comes from a feeling of the filmmaking itself being more pronounced here than in Shotgun Stories. When I was filming Take Shelter, I was thinking of The Shining (1980), not only in terms of how Kubrick engaged in invisible horror but maybe more so in creating a world just off screen that’s pressing in on the character. There are camera movements and dream sequences in Take Shelter, so maybe the whole film elevates the filmmaker to a more visible presence. At the same time, I dislike unmotivated camera movements. SCOPE: Speaking of what’s on screen and off, I noticed that the tension in the film is amped up considerably with subtle things, like when the sky is more visible. NICHOLS: Yeah. I had watched Safe (1995) a lot, and noticed that Todd Haynes used close and full shots in unnerving ways, and also engaged in that feeling of invisible terrors. If you have terror from above, like the sky, then a 2.35 aspect ratio is really good, because you can close down on your characters and you have more room on the left and the right, and less on the top and bottom. We cheated a bit above the eye line of the frame. You can then keep elements like the sky hidden when you want to. We shot when it was windy, because it could suggest disturbing weather, and you don’t need the sky—helpful on our extremely low budget. We shot in Ohio, which I had never visited before, and we quickly discovered that the area gets what’s known as “lake-effect weather,” since the Great Lakes are large enough to produce their own weather systems. Every 30 minutes, a whole different weather pattern would come blowing through, which really helped. SCOPE: You’re from Arkansas, where Shotgun Stories was filmed. You shot Ohio much like you shot Arkansas, with figures in flat grasslands under large skies. NICHOLS: It’s interesting that you noticed that, because I wrote Take Shelter for Arkansas. We looked for farmland that was about 90 minutes southwest of Cleveland. I wanted long horizon lines, especially effective for visualizing giant storms. However, I didn’t pretend that Ohio was Arkansas. I told the actors that we’re in Ohio, so do Ohio. I have to be very honest in the places that we’re filming. How people in that place talk, what they eat, what kinds of cars they drive. Not everyone drives a cool ‘70s pickup truck. SCOPE: You’ve seemed to observe these details very closely, like the class differences. NICHOLS: Mike and I had conversations about the economic differences between the guys in Shotgun Stories and in Take Shelter. Curtis has a regular job and is much more middle class than his earlier character, Son. A Ford Focus isn’t particularly visually interesting, but that’s the kind of car that Samantha would be driving. It’s easy to make rusty cars look interesting, but not necessarily suburban homes. You want to make it look lived in but not too affected. SCOPE: Would you describe yourself as a director grounded in classical film language? NICHOLS: I think so. I love films and see a lot of them, but you could drop me into a film class and I might be lost. There are five films I like. Four of them star Paul Newman. There’s The Hustler (1961), Cool Hand Luke (1967), Hud (1963), Badlands (1973), and the fifth gets interchanged between Butch Cassidy and the Sundance Kid (1969), The Shining, Close Encounters of the Third Kind (1977), Jaws (1975), and Stagecoach (1939). All of these films are directed by a very specific hand. Almost all of them are in Scope and treat the Scope frame with extreme brilliance. I was watching Butch Cassidy on a plane, without sound, and noticed that scenes were shot in fluid master shots; they’re not in a rush to cut images together to get you some place, but they don’t feel slow. The camera moves at the perfect moment. It feels like a scene that was edited together, but you realize that there were only one or two cuts. SCOPE: Absolutely. As a viewer, you are somehow both not aware of the camera and quite aware. This is something, as you note, that you see in Ford, through Preminger, and on through to Béla Tarr. You conceive in terms of these invisible cuts? NICHOLS: It’s extremely hard to achieve, but that’s my aim. Spielberg may not get enough credit in this area, but he did it brilliantly in Jaws, like the way he achieved certain effects by suddenly altering your point of view—he either did it by framing his actors in a certain way or did it with the camera. I’ve watched it several times, and I still can’t tell how he did it. Not to compare myself with him, but if you watch Take Shelter without sound, you may notice that same kind of presence/non-presence of the camera. I think that when people watch films, they’re wholeheartedly affected in ways they don’t realize, and don’t know why they’re feeling that way. I work really hard on the first ten to 15 minutes of a film to make it affecting, because those are the minutes when people tend to closely judge films. You get them or lose them in those early minutes. It’s this whole build-up to that moment early on when the dog bites Curtis’ hand. SCOPE: Neither film is gentle in the opening minutes, and tells the audience to take it or leave it. Along with affecting the audience, would you also say there’s that challenging attitude in your work? NICHOLS: There’s a definite challenge to the audience in both films, but they happen in completely different ways. I knew it was going to be tricky in Shotgun Stories, since in the first 45 minutes, nothing much was going to happen except this gradual picture forming of the characters and who they are. My thinking was that if you invest in that time with them, that when the character of Kid is killed, you would feel something intensely. It’s worth the risk, I calculated. When the drama hits the fan, if you’ve stuck around, you’ll be around for the rest of the film. I don’t write in a three-act structure. With Take Shelter, the narrative experiments occur more in the latter stages, when things get stranger and stranger and Curtis’ fears seem more real than ever. SCOPE: Perhaps this is why watching Take Shelter produces a physical reaction that I find fairly seldom in films, a feeling that’s like a pressure on your chest, close to extreme discomfort. NICHOLS: Wow, that’s great, that’s a wonderful reaction. Larry Brown, one of my favourite writers, talks about how he likes to sandbag his characters from page one. I want to put the screws on this guy, and the screws keep getting tighter and tighter. Nothing works for him, like when he goes to the therapist for an appointment, and the therapist’s not there. I think Mike had something to do with applying that pressure too. SCOPE: Do you consider yourself more of a writer or more of a director? NICHOLS: I think I’m more of a screenwriter than I am a director. When I’m feeling problems on the set, my script is my ally. I don’t work so that people can riff off the script. You’ve got a plan, and you execute the plan. I spend a long time on my scripts, and if I make changes during the filming or editing, I ask myself if I have good reason for changing something. Someone like Malick would be the opposite of this. I also spend more time with a film as writer than in any other role. I’ll take a year thinking about a story and collecting moments, ideas, characters, and situations like a tape ball. Nothing goes down on paper. Then I’ll put things down on cards and lay them on the floor. I may know that I want a scene, but not know where it’ll fit. I’m a linear thinker. The story then begins to move. I’ll outline without any cards, and that process may take three to four months. The script comes pretty quickly after that. I’ll write for five to six hours a day, maybe four to 12 pages a day, like going from a pencil sketch to colour paint. I’ll let about four people read my stuff to make sure it makes sense. Then I read it straight through, usually tweaking it a bit. When you write it out, you get a sense of how long scenes will actually be, and how the story is flowing. At that point, I’m pretty much locked in.